Two years ago, a friend from Malta visited me in Berlin. It was a short visit, we only had a few hours, but we made the most of it and enjoyed an afternoon of baking in my kitchen. 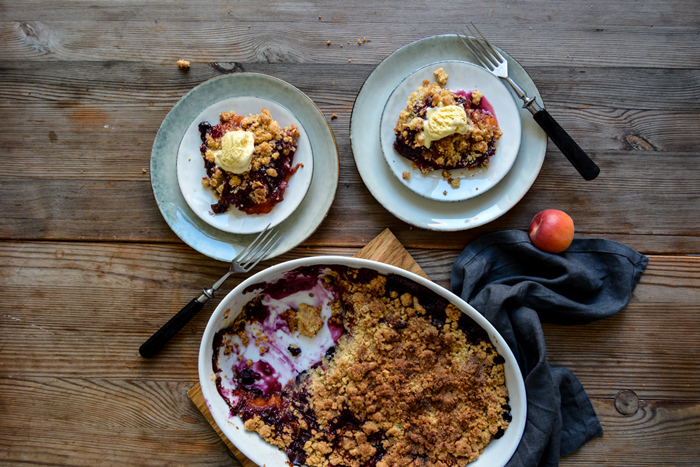 The result was nothing less than heavenly: Cristina’s addictive Gooseberry Crumble! Cristina is the sweetest girl, she’s Maltese-German and a close friend of my boyfriend’s sister Emma. I’ve seen the two girls giggling and baking so often in my Maltese mama’s kitchen and they always reminded me of myself as a teenager. Those afternoons with my girls, a pound of flour, sugar, and eggs, created some of the best memories of my early teenage years. There’s something about the combination of young girls and baking, that seems like a match made in heaven. 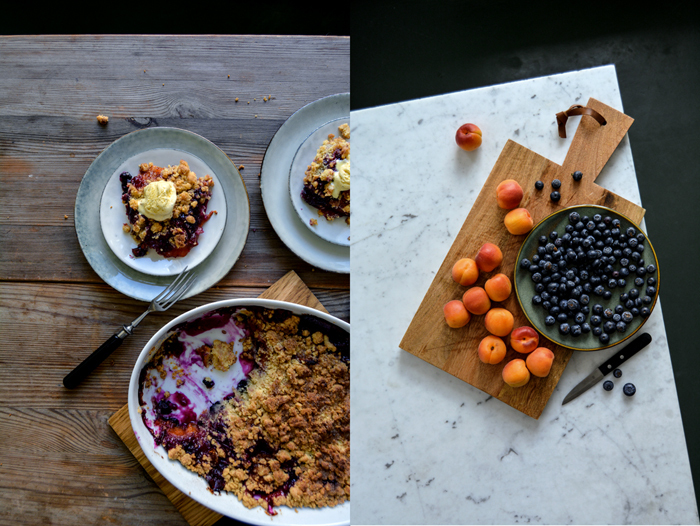 How much we enjoyed trying out new sweet recipes or baking our old classics again and again and again (red wine cake was always high up on our list!). It was an innocent time, before the real troubles of life started. 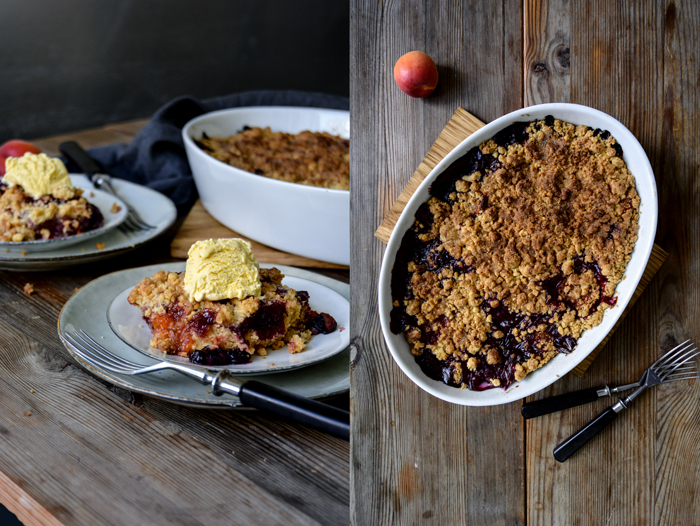 When I saw the pictures of Cristina in the meet in your kitchen feature I did with her 2 years ago, how she made this wonderful crunchy crumble in her pretty white dress, I felt reminded of my early baking days – and of this fantastic recipe! 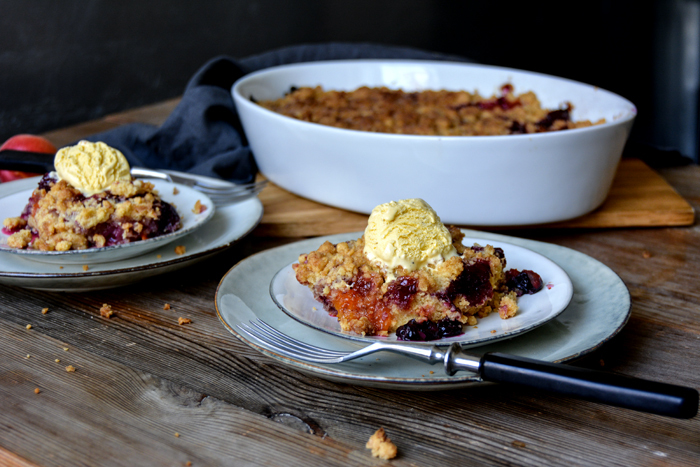 As I got over the first wave of nostalgia, I pulled out the baking dish and made a sweet and fruity crumble with apricots and blueberries – nice! I’m sure Cristina would approve of it, especially the scoop of vanilla ice cream! Preheat the oven to 190°C / 375°F (preferably convection setting) and butter a medium baking dish (mine is oval, 19 x 28cm / 7 1/2 x 11″). 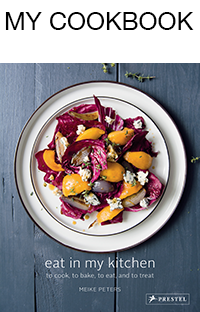 Spread the apricots and blueberries in the prepared baking dish. For the topping, combine the sugar and cinnamon. In a large bowl, combine the flour, sugar, and salt. Add the butter and quickly mix with your fingers until you have a crumbly mixture. 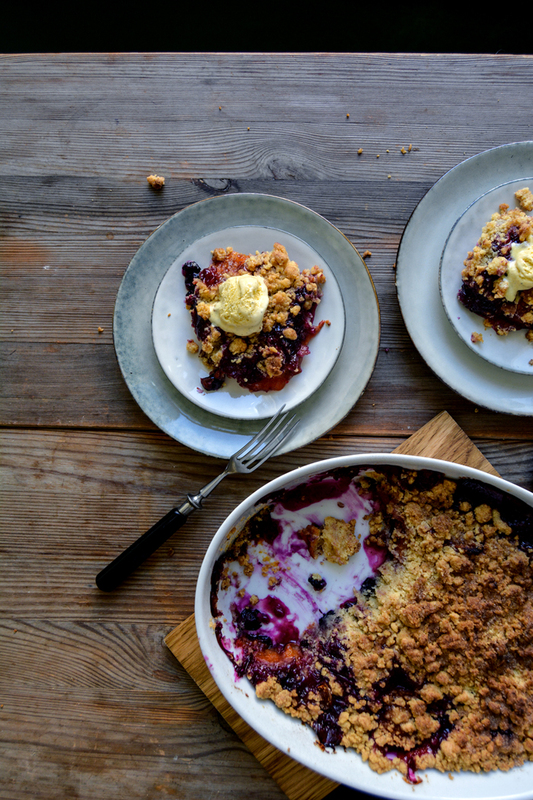 Spread the crumbles on top of the fruit and sprinkle with the cinnamon sugar. Bake for about 40 minutes, or until golden brown and crisp. Let it cool for about 10 minutes and serve warm or cold with vanilla ice cream. 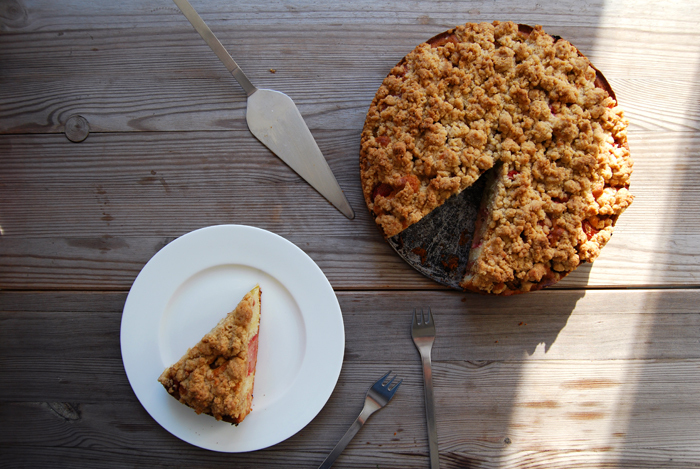 Rhubarb Crumble Cake, truly addictive! 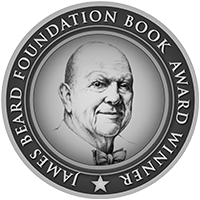 There are two of my recipes, classics, that I can’t live without. I constantly adapt and change them according to the seasons and there isn’t a month without them. 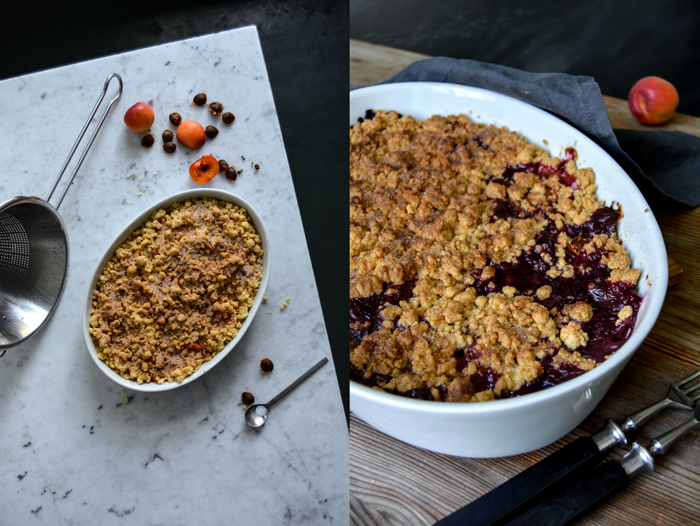 I’m talking about my beloved quiche and my crumble cake, filled with seasonal fruit and topped with the most amazing crumbles, buttery and crunchy! In winter I filled it with apples, now it’s time for rhubarb and there will be more to follow. I have no preference, I love all of them! For this cake, I like to choose fruit with a strong texture, the dough rises around these moist pockets and stays juicy without becoming soggy. I use lots of cinnamon for the crumbles, one of my favourite spices for baking which refines the fruit’s flavours perfectly. 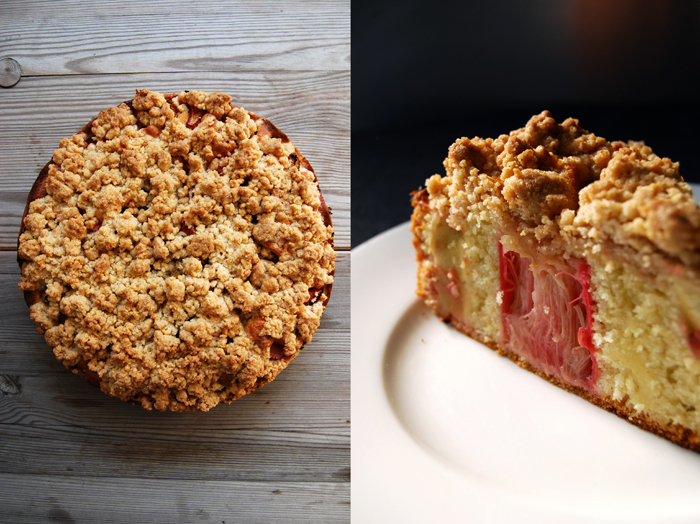 The rhubarb brings in a bit more sourness than the apples, it fits to the fresh feeling of this season. 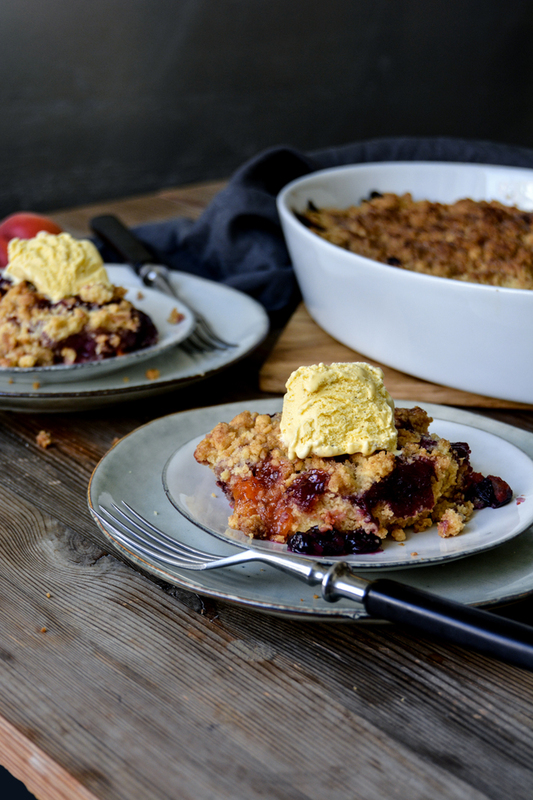 In the post about my apple crumble I’ve praised the cake’s light and spongy base, the perfect composition of soft, juicy and crunchy and its dessert and teatime qualities. 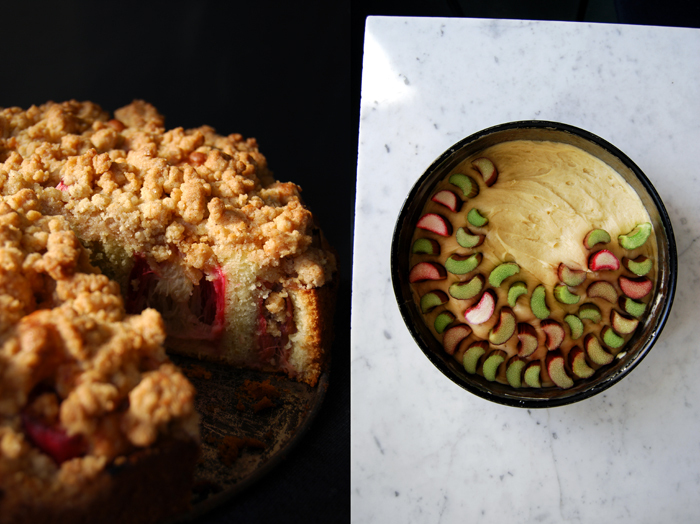 Now it’s time to bake rhubarb crumble, but be prepared, this cake is truly addictive! 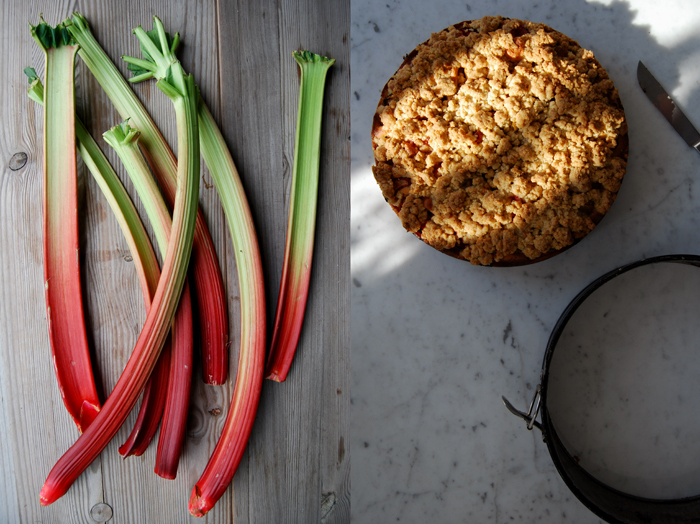 Prepare the dough for the base first, the rhubarb afterwards and the crumbles at the end. Set the oven to 180°C / 355°F. For the base, beat the butter, sugar and vanilla till fluffy. Add the eggs, one at a time and continue mixing for a few minutes. Add the flour mixed with the baking powder and salt and continue mixing until well combined. Scrape the dough into a buttered springform pan and arrange the rhubarb vertically in circles pushing it into the dough. 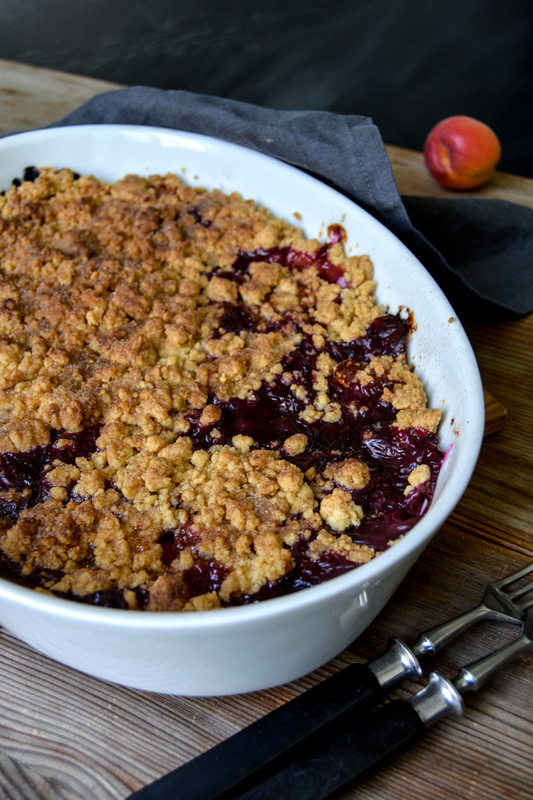 The crumbles need good preparation as you have to make sure that the mixture is neither too moist nor too dry. Have some extra flour and melted butter close at hand so that you can add some immediately if necessary. Combine the dry ingredients in a bowl. Pour the melted butter on top and mix quickly with the hooks of your mixer, stop as soon as it crumbles. If the crumbles are too moist and sticky add a bit more flour (1-2 tablespoons). If they are too fine and don’t form bigger crumbles add more melted butter. 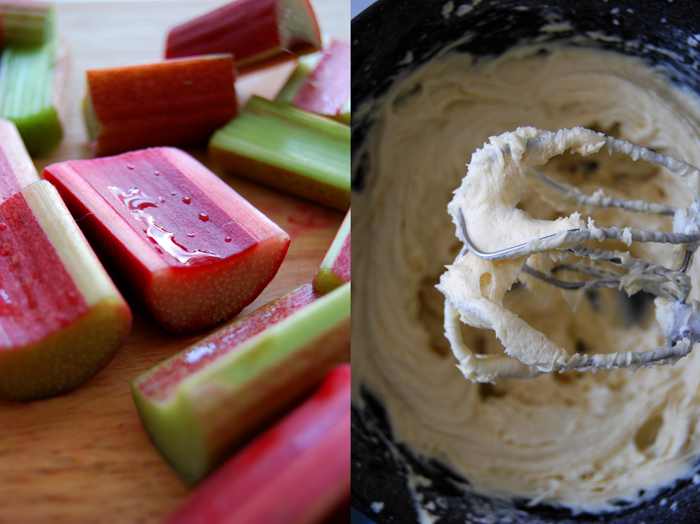 Spread quickly on top of the rhubarb. If you have bigger lumps of crumbles you may have to separate and spread them. Bake in the oven for 55 minutes or until golden. Check with a skewer, it should come out clean, and let it cool. You can serve the cake with sweet whipped cream or vanilla or cinnamon ice cream. My aunt asked me for a helping hand in the kitchen because she had a baking marathon of three cakes to manage in one day, so I decided to bake one of them. She let me choose, they all sounded nice but I went for a recipe which I wouldn’t usually bake. 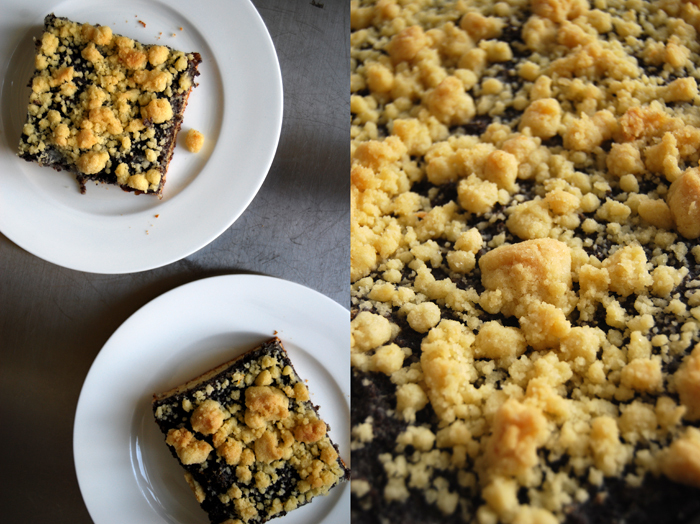 It’s a poppy seed crumble cake with a sweet yeast dough, an old German recipe which she got from her friend Elsa many years ago. I’m happy about my choice as the yeast dough alone is already wonderful, light and not too sweet. I will definitely use it for other recipes soon, maybe a Sunday morning Challah (plaited yeast cake). Although it’s so light and spongy it’s still strong enough to carry the thick layer of smooth poppy seed cream, semolina, ground almonds and raisins. If this wasn’t enough, the cake is topped with crunchy buttery crumbles (I used the crumble recipe of my Apple Crumble Cake). 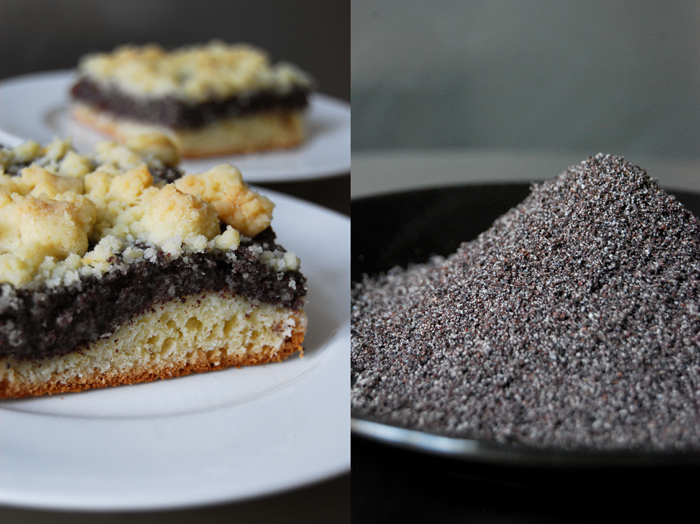 When I was a child, I loved poppy seed swirl cake. I couldn’t get enough of it, but then at one point I lost interest for no apparent reason. So for years I haven’t baked with these crunchy black seeds at all but I think they will return to my kitchen after this cake! Combine the dry ingredients, add the milk, butter and eggs and mix with your dough hooks for 5 minutes. Continue kneading with your hands for a couple minutes. Put the dough back into the bowl, cover with a tea towel and let it rise in a 35°C / 95°F warm oven (top / bottom heat) for about 45 minutes until well risen. Prepare a baking sheet with parchment paper. Roll out the yeast dough and put it on the baking sheet. Cover with a tea towel and let it rise for 15 – 20 minutes in a warm place. 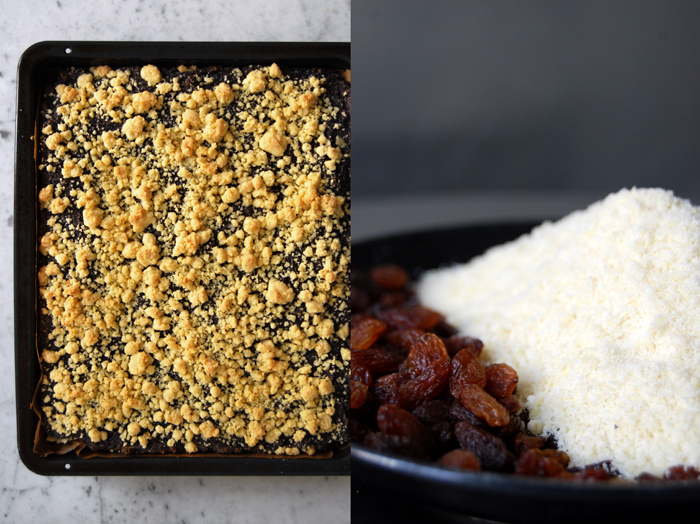 Set the oven to 175°C (top / bottom heat) and prepare the poppy seed mixture and crumbles. In a large pot, bring the milk, semolina, sugar, salt and egg yolks to the boil, stirring constantly. Continue stirring and let it cook for 5 minutes on medium heat. Add the poppy seeds, almonds, raisins and lemon zest, combine everything and set aside. Combine the dry ingredients in a bowl. Pour the melted butter on top and mix quickly with the hooks of your mixer, this shouldn’t take longer than 20 seconds. If the crumbles are too moist and sticky add a bit more flour (1-2 tablespoons). If they are too fine and don’t form bigger crumbles add more melted butter. 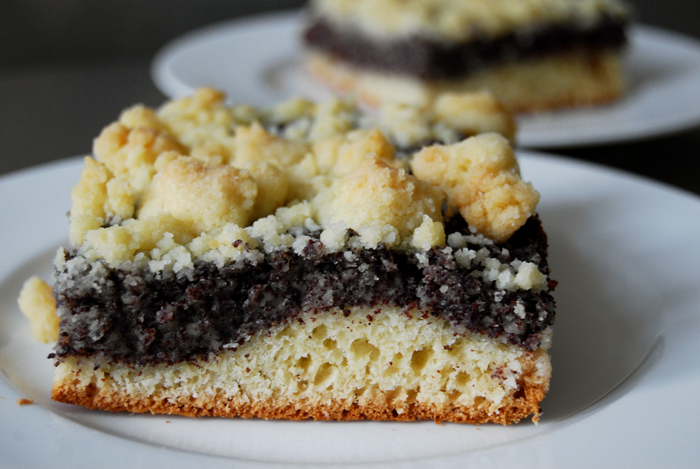 For the cake, spread the poppy seed mixture over the yeast dough and sprinkle with the crumbles. Bake the cake for 40 minutes or until the crumbles are golden.